Telescopic Pool Pole 14-In. To 4-Ft.
HTH, 3 Sections, 4' To 14" Telescopic Pole, Use with Brush, Hose or Leaf Skimmer. HTH Algae Guard 30 38 oz. HTH® algae guard 30 is a concentrated, non-foaming algaecide product that when used regularly, will prevent and kill the growth of green, black and yellow algae. • Automatically releases sanitizer into spa or pop up pool. Automatically releases sanitizer. Adjustable ring controls amount of sanitizer. Ideal for all spas & pop up pools. Child resistant locking mechanism. Automatically releases chlorine into pool. Provides steady & continuous sanitization. Adjustable ring controls the amount of chlorine dispersed into pool. HTH 1 In. Chlorinating Tablets 1.5 lb. HTH 1" Chlorinating Tablets 1.5#, sanitizes pool water, stabilized (sun protected) for extended chlorine life. Active ingredients: Trichloro-s-triazinetrione 92.4%, other ingredients 7.6%, avialable chlorine 84%. HTH 3 in. Super Chlorinating Tablets 10 lbs. "The HTH® super 3"" chlorinating tablets, 10 lbs., are an effective swimming pool water sanitizer. These convenient and easy to use tablets are formulated to protect against chlorine loss in direct sunlight, and can be used in feeders. They are designed to dissolve slowly to provide a steady source of available chlorine." Your pool stays fresh and clean with HTH® sanitizer products, designed to effectively guard against bacteria, algae, and other organisms. HTH 3 in. Super Chlorinating Tablets 15 lbs. "The HTH® super 3"" chlorinating tablets, 15 lbs., are an effective swimming pool water sanitizer. These convenient and easy to use tablets are formulated to protect against chlorine loss in direct sunlight, and can be used in feeders. They are designed to dissolve slowly to provide a steady source of available chlorine." HTH 3 in. Super Chlorinating Tablets 5 lbs. "The HTH® super 3"" chlorinating tablets, 5 lbs., are an effective swimming pool water sanitizer. These convenient and easy to use tablets are formulated to protect against chlorine loss in direct sunlight, and can be used in feeders. They are designed to dissolve slowly to provide a steady source of available chlorine." hth® alkalinity increaser raises total alkalinity in swimming pool water. The ideal alkalinity range is 60-120 parts per million. If the total alkalinity is too low, pH will fluctuate excessively. From simple issues like cloudy water or pH fluctuation to more specialized problems like metals in your water and cleaning filters, these products work fast and effectively to tackle most common pool problems. Keeping these products handy helps ensure a clean pool. HTH Pool Stabilizer & Conditioner 4 Lbs. "HTH® stabilizer, 4 lbs., helps to protect and extend the life of chlorine in swimming pool water. It slows the loss of chlorine caused by sunlight. Use this product if sunlight makes it difficult to maintain the correct chlorine level. " 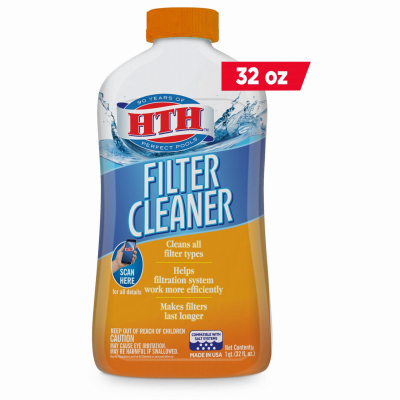 HTH Swimming Pool Filter Cleaner 32 oz. HTH® filter cleaner is a non-corrosive fillter cleaner and backwash aid. This product is designed to improve your filter's efficiency by removing dirt, lotions, body oils, insects, leaves, and other pool contaminants. HTH® filter cleaner is a dye-free and fragrance-free proprietary blend of proteins and surfactants. Cleaning your filter on a routine basis helps your filtration system work more efficiently and extends the life of your filter. Skims debris off water surface. Has puncture resistant net and reinforced aluminum frame for extra durability. HTH Pro Leaf Rake. Deep net scoops debris from pool floor. Has reinforced aluminum frame for extra durability. Has handle for easy emptying of debris. HTH Pro Curved Wall Pool Brush 18 in. HTH Pro 18" Curved Wall Brush cleans pool walls effectively. Has reinforced aluminum frame.